(Nanowerk News) Finding out whether you have been infected with dengue may soon be as easy as spitting into a rapid test kit. The Institute of Bioengineering and Nanotechnology (IBN) of A*STAR has developed a paper-based disposable device that will allow dengue-specific antibodies to be detected easily from saliva within 20 minutes. This device is currently undergoing further development for commercialization. IBN Executive Director Professor Jackie Y. Ying shared, "Our rapid diagnostic kit can detect a key dengue antibody from saliva that is present in early-stage secondary infection. The ability to differentiate between primary and secondary dengue infections makes it a valuable early diagnosis tool that would help to ensure timely treatment and proper care of patients." According to Singapore's National Environment Agency, dengue fever and its more severe form, dengue hemorrhagic fever, are the most common mosquito-borne viral diseases in the world. This disease poses a serious health threat, and is a leading cause of illness and death in tropical and subtropical climates. There are four known serotypes of the dengue virus but no vaccine or medicine has been developed to treat the illness. The incubation period before symptoms develop generally ranges from 4 to 10 days after infection. Therefore, early diagnosis would enable the patient to receive prompt medical attention and avoid further complications. Currently, dengue infection is diagnosed in the laboratory by testing the patient's blood sample for the presence of dengue antigens or antibodies. IBN's device, on the other hand, is capable of detecting IgG, a dengue-specific antibody found at the onset of secondary infections, directly from saliva in one step. Unlike blood samples, saliva can be collected easily and painlessly for rapid point-of-care diagnostics. However, unlike other body fluids, it cannot be applied directly to commercially available test kits as it would cause the sensor nanoparticles to stick haphazardly to the test strip. In addition, conventional paper-based tests are not designed to handle the larger sample volume of saliva required. As described in the journal Lab on a Chip ("A stacking flow immunoassay for the detection of dengue-specific immunoglobulins in salivary fluid"), the IBN researchers used an innovative stacking flow design to overcome key challenges faced by existing lateral flow designs, such as those used in pregnancy test kits. In IBN's device, different flow paths are created for samples and reagents through a multiple stacked system. This allows the saliva sample to flow separately through a fiber glass matrix, which removes the substances that would interfere with the nanoparticle-based sensing system before it mixes with the sensor nanoparticles. IBN's device configuration also helps to regulate the flow in the test strip, generating uniform test lines for more accurate results. 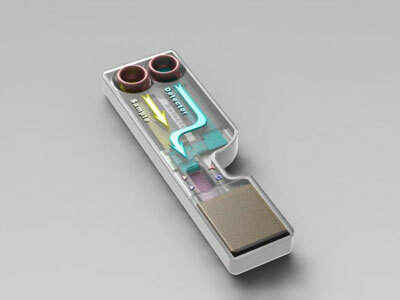 IBN's diagnostic kit can also be adapted to detect other infectious diseases such as HIV and Syphilis. The IBN researchers are also investigating the use of other common fluid samples, such as blood, urine and serum for rapid, high-sensitivity test kits. The Institute is currently collaborating with ARKRAY Inc., a pioneer in the field of automated analysis systems, to commercialize its paper-based diagnostic technology. In 2013, ARKRAY opened its first Asian research center outside Japan in IBN with an investment of S$9.1 million over five years. The research center is focused on developing novel detection kits for infectious diseases based on IBN's innovative diagnostic platforms. Mr. Atsushi Murakami, General Manager of the R&D Division of ARKRAY Inc., said: "We have developed an excellent working relationship with IBN over the past two years, and our research activities have progressed rapidly. Together, we will continue to focus on the successful commercialization of new technologies for the diagnosis of tropical infectious diseases."